Last time I posted a blog entry, it was about Eating With Sinners--and how thankful I am that God chooses the weak to dine with, rescue, and heal. But TODAY, I'm making an about face. Well, sort-of. God knows that all of us--rich or poor, ugly or beautiful, ALL NEED a Master Physician, Savior, and Friend. 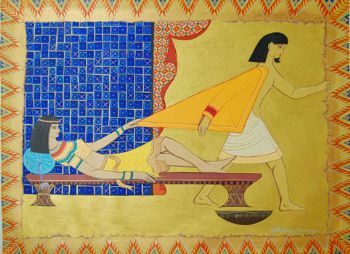 I was reading Genesis 39-40 about when Joseph was a slave working for Potiphar in Egypt. I happened upon this verse in Gen. 39:6a "So Potiphar left everything he had in Joseph’s care; with Joseph in charge, he did not concern himself with anything except the food he ate." (NIV). Potiphar was one of those beautiful people. He had it all--he was WAY up in the government, had lots of responsibilities, had slaves. Then it says the only thing he had to concern himself with in his home was the FOOD HE ATE. I know I've got my food radar up--and there are lots of mentions of food in the story of Joseph (sheaves in field bowing down to him, wine-taster and baker in prison, etc. ), but this mention is just slipped in like a side-note. It doesn't even seem relevant to the story. But there it is: hidden in a bigger picture. What can I learn from it? I think there is a truth that it doesn't matter who we are in this world--well-off or struggling, we are ALL faced with a similar concern: the FOOD WE EAT. Even if we have everything else in our lives under control and well-managed, we still have to concern ourselves with making healthy choices. Being beautiful and successful doesn't exclude us from the struggle and temptation of gluttony. God made us with appetites. We are created with both hunger and passion. But we are also given the RESPONSIBILITY to manage our bodies and appetites. Acting like we are citizens of heaven would change everything! Proper stewardship of our bodies would just be the beginning. I believe it would turn the world upsidedown! Good thoughts!